TAMPA, Fla.— A 40-year-old man faces a felony DUI manslaughter charge and seven counts of DUI with personal injury after Tampa Police say he crashed into a car and killed a teen. Anthony Hunter was just getting off work around 10 p.m. when he realized something serious was happening at the intersection of Nebraska Avenue and Bird Street East. "I saw a bunch of lights and ambulances. I didn't know what had happened," Hunter said. According to arrest records, Omar Wilson was driving a red 2000 Ford sedan northbound on Nebraska Avenue around 9:25 p.m. when, according to a witness, he ran a red stop light and crashed into a gold Chrysler van. Inside the van were eight people. A teenage boy was ejected in the crash and later died. "It's sad you know because we all have dreams and potential and he'll never see his dreams or reach his potential," said Hunter. The other seven passengers had minor injuries. A responding Tampa Police officer noticed Wilson had slurred speech and was rocking back and forth. The report says Wilson was crying as Tampa Fire Rescue paramedics treated him. Officers observed an empty liquor bottle inside the car Wilson was driving. "It is irresponsible. They don't think about their choices or the consequences," said Hunter. The report redacts his medical blood alcohol level and states Wilson refused to submit a breath test, but the report does indicate a legal blood draw was taken by search warrant. ABC Action News looked into Wilson's criminal record and did not find any former alcohol related charges. It's been a deadly and dangerous weekend out on Tampa Bay roads with St. Patrick's Day celebrations. 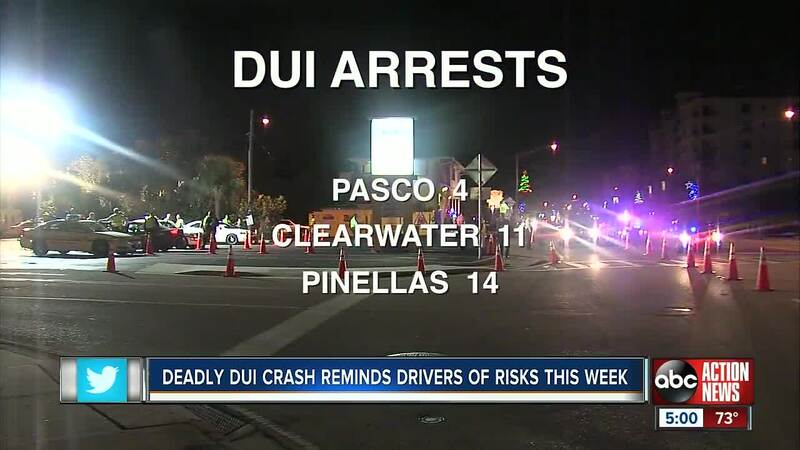 Clearwater Police arrested 11 people for DUI. Pasco County deputies arrested four drivers over the holiday weekend for DUI. In Manatee County deputies arrested one person for DUI. In Pinellas County a combined taskforce including Largo PD, the Pinellas County Sheriff's Office, Gulfport Police and the Florida Highway Patrol arrested 14 people for DUI. "Plan in advance that's the biggest thing," said Sgt. Steve Gaskins with FHP. "People are drinking, consuming alcohol and they start making poor decisions very, very rapidly and people end up paying the price like we saw this weekend." Authorities are not letting up. The Hillsborough County Sheriff's Office says March 18 marks the first day of Spring Break for more than 200,000 students, 15,000 teachers and staff in the county. Additionally thousands of college students from across the U.S. are headed to Florida. HCSO took to social media to release a Public Service Announcement warning drivers not to drink and drive. "I plan to increase our deputies' presence throughout all of Hillsborough County to make sure anyone who gets behind a wheel under the influence is caught and prosecuted," said Sheriff Chad Chronister. "It's not worth losing your license or your life for one bad mistake, so remember this phrase: Night out on the town? Put the keys down." Most Bay area authorities promising extra patrolling during Spring Break. "Help us help you make the community safe. Don't get behind the wheel of the car if you've been drinking," said Gaskins.